Media and Contents: Soft cover, 96 pp. 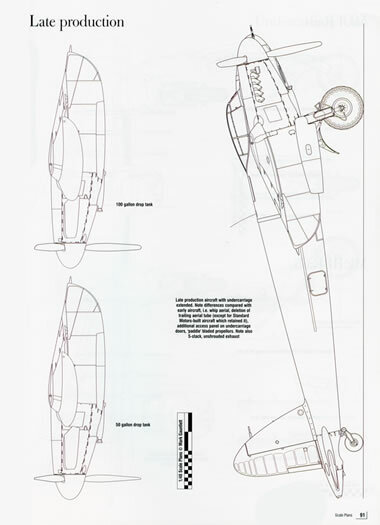 Advantages: Complete rundown on featured aircraft; logically laid out; profusely illustrated. Conclusion: The book will provide you with excellent reference to both detail and paint your FB VI Mosquito model be it one of the superb 1/72 scale Hasegawa ones, the 1/48 scale Tamiya and Revell ones or the Airfix magnum opus in 1/24 scale. The Aviation Guide series of books SAM Publications is aimed squarely at the modeller. They provide you with a complete “package” to help you to accurately replicate your chosen subject in model form. 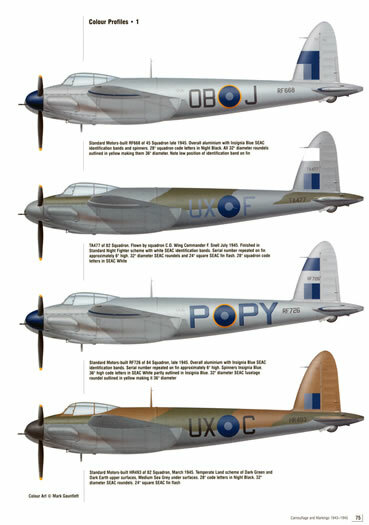 To date there are just three titles in the series, the others being the IAR.80 and IAR.81, and the Fairey Battle. 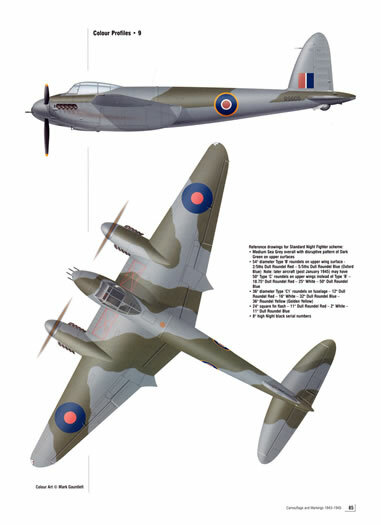 This volume, number 2 in the series, concentrates on the just the FB Mk VI version of the De Havilland Mosquito. Chapter 1 – The Concept. 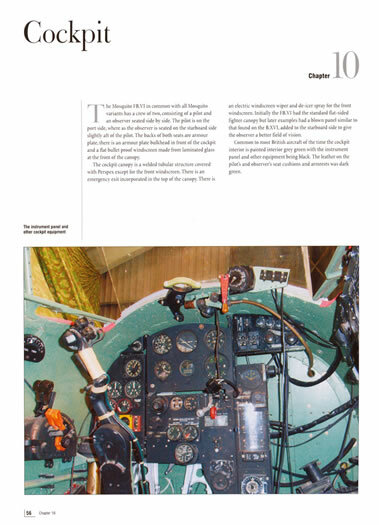 This chapter comprises four pages in all and provides you with an overview of how the FB Mk VI came into being and the trials and tribulations it underwent in service including the issues with its operation in the Far East and the harsh tropical climate’s effect on the wing’s glued joints. 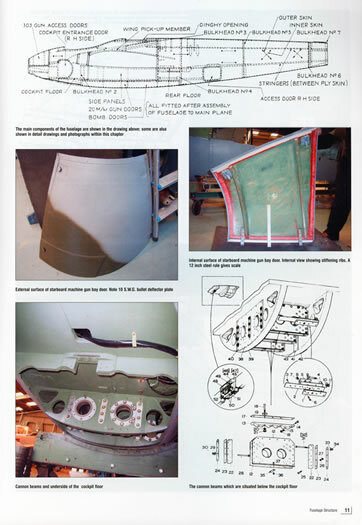 Chapter 2 – Fuselage Structure. 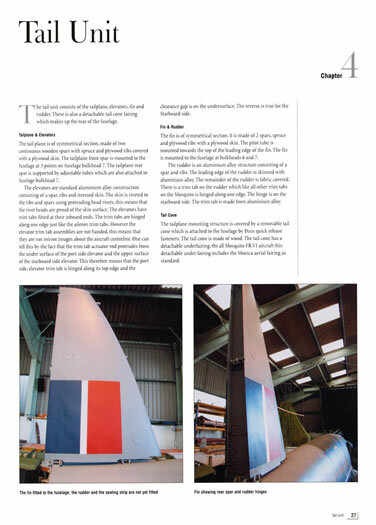 A 10 page chapter, it is commenced by a written description of how the fuselage was constructed and is followed by original factory drawings backed up by full colour images of extant airframes which are accompanied by comprehensive captions. This format is used for all chapters as well. Chapter 3 – Wing Structure. Seven pages in all apart from the wings themselves, it also covers the flaps as well as the radiators and oil coolers. Chapter 4 – Tail Unit. 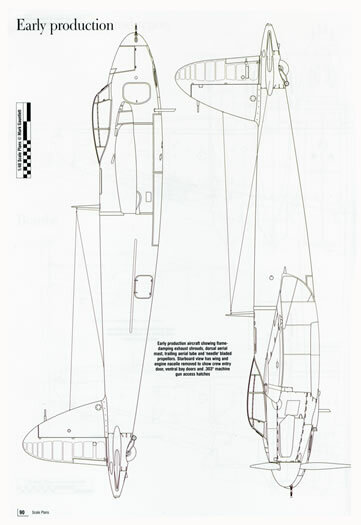 Five pages covering the tailplane and elevators, the fin and rudder, and the tail cone. 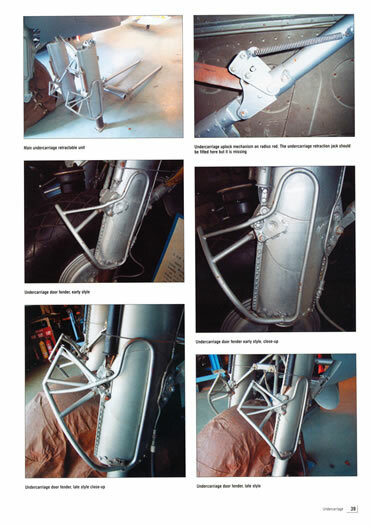 Chapter 5 – Engine Installation. Four pages. Chapter 6 – Undercarriage. 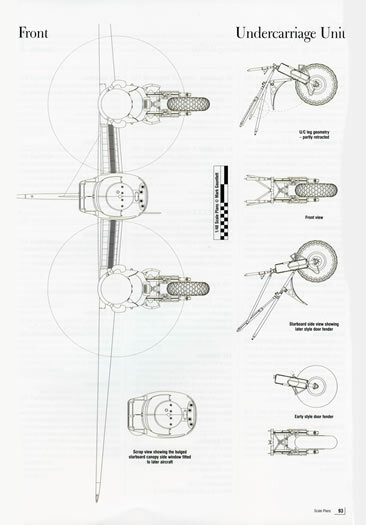 Ten pages and includes the tail wheel as well as the mains. Chapter 7 – Fuel System. 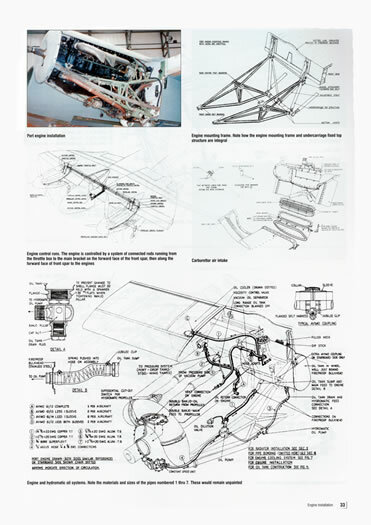 Just four pages but it also includes coverage of the long range fuel tank and its attachment and release mechanisms. Chapter 8 – Hydraulic & Pneumatic Systems. Four pages and is made up of just factory drawings. Chapter 10 – Cockpit. Fittingly, the cockpit is afforded 10 pages as it will be the most detailed part of a Mosquito model build. 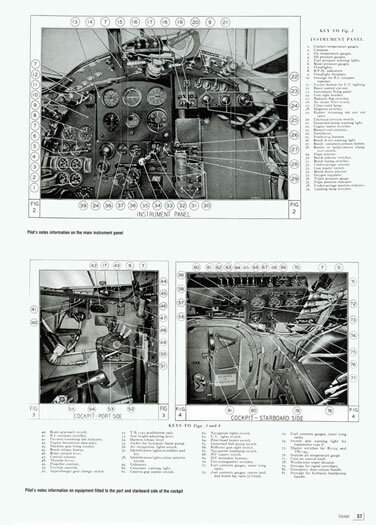 Original photographic coverage from what appears to be from the Pilots Notes that names each and every instrument and control on both sides of the cockpit as well as the instrument panel. Full colour images of extant airframes are included too. These latter are oblique shots that show how the electrical wiring is run and attached to the airframe. I was impressed with the photographic coverage here as instead of a single full colour shot there are several so as you can gain a full understanding of what fitted where. Chapter 11 - Armament. Eight pages in all. It covers the Hispano 20mm cannons as well as the ·303 browning machine guns, bomb racks and rocket rails. Chapter 12 – Camouflage and Markings 1943 – 1945. A 12 page chapter, it provides information on the “Intruder Scheme”, the “Coastal Special Duties Scheme A”, “South East Asia Command Scheme”, schemes within the Second Tactical Air Force, as well as information on Allied Expeditionary Air Forces ‘D Day’ stripes, upper wing national marking change, and the British Overseas Airways Corporation Schemes. 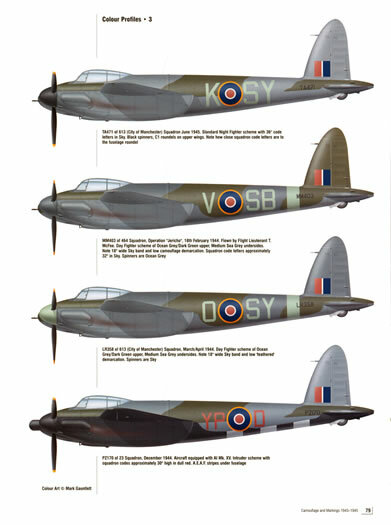 The chapter includes seven pages of full colour profiles – 19 individual machines in all – as well as a generic left hand side profile and an upper surface plan view to illustrate the standard night fighter scheme – funnily enough, no right hand side profiles are provided at all so you are on your own here when trying to discern the camouflage pattern. 1/48 Scale Plans. A useful tool. Upper and lower surface plan views as well as separate drawings to show location/placement of the long range tanks, rocket rails and inner and outer views of the nacelles are provided. Smaller separate drawings are also provided of the undercarriage (both sides) and finally, a front on view. Appendix I. A listing of the 32 British and Commonwealth squadrons that operated the FB VI during WW11. A simple listing that identifies the squadron, wing and group along with the dates that they operated it and the squadron code letters it wore. Appendix II. A listing of the 2,282 FB VI airframes that were delivered between June 1942 and July 1946. The appendix is tabulated by serials as well as by the De Havilland contract as well as the Standard Motors and Airspeed contracts. The book is A-4 in size, soft bound and comprises 96 pages printed on good quality glossy paper. Be careful how you flatten the book out on your modelling bench as I managed to damage the binding on mine when I flattened it out too much to scan the pages for this review! Sam Publications list it at £15.00 (plus postage and packing) which is a bargain for what you are getting as far as I am concerned. 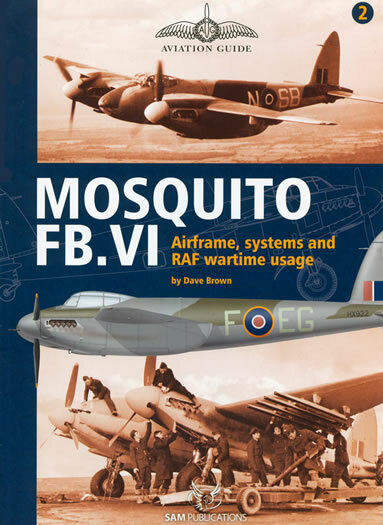 The book will provide you with excellent reference to both detail and paint your FB VI Mosquito model be it one of the superb 1/72 scale Hasegawa ones, the 1/48 scale Tamiya and Revell ones or Airfix Models opus in 1/24 scale.